When a song by the mad composer, Carlo Gesualdo, is discovered in Exeter Museum, trouble descends on the group asked to sing it. Lisa is full of enthusiasm at first, but she soon becomes convinced the song is cursed. Can Lisa find out what mystery lies behind the discordant harmonies? Will she solve the song’s secret before her relationship with Jon breaks for good and harm befalls them all? In Renaissance Naples, young Silvia Albana is seamstress and close confidant of Don Gesualdo’s wife. When Donna Maria begins an affair, Silvia knows that death is the only outcome. But who exactly will die? And where is Silvia’s own lover? Why is he not there to help her? Secret of the Song was a complete revelation to me. With its two distinct time frames and a potentially cursed piece of music that connects them, I had no idea how the novel would pan out. But there was no time to think about this as I was completely hooked from the start. This is a great example of the time slip genre. Secret of the Song could also be classed as a crossover read, accessible to both young adult and adult readers alike. Its two protagonists – a young seamstress from Renaissance Naples, and a contemporary thirty-something Exeter musician – are both well-drawn characters who share the simple dream of being happy and in charge of their own destiny. This is a book that plunges you into a dark and mysterious15th century Italy, but pulls you back to modern day Britain with its equally compelling story. Mystery, murder, music, lust, love and longing weave the two threads together. I particularly liked Sylvia, the Italian – she is flawed but strong and talented and I think teenage readers will relate to her. She reminds me of the heroines of Tracy Chevalier’s Girl with a Pearl Earring and The Lady and the Unicorn. A young woman who has no power but who uses her wits to avoid becoming a victim of circumstance and class. The theme of music is cleverly woven throughout the dual narratives. With its different tones and shades of light and dark, this novel is like an opera, both dramatic and intensely human. The beautifully realised settings, in time and place, paint a vivid background against which the action plays out. Dual narratives are very hard to pull off as often one of the stories is more powerful or emotionally charged than the other. But Cathie Hartigan uses great skill to achieve a fine balancing act between the two and to give the reader a deeply satisfying read. The entwined narratives zip along with two equally compelling voices and I felt I knew both leading characters so well by the end of the novel. 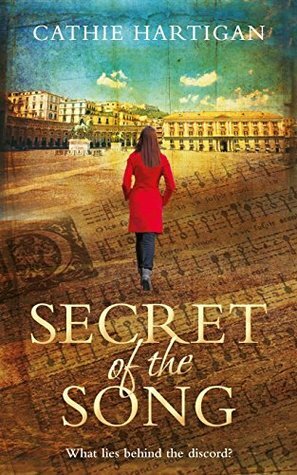 Secret of the Song is perfect for fans of Tracy Chevalier, Sally Vickers, Kate Morton and Daphne du Maurier with its attention to the smallest of details and its sweeping emotions that cross all barriers of time, background and culture. A read that will keep you in its grip until the last page.